Explore the mysterious land of the Ottomans Intrepid-style. Marvel at Mehmet Aga’s masterpiece, the Blue Mosque, and bargain for trinkets in Istanbul’s massive Grand Bazaar. 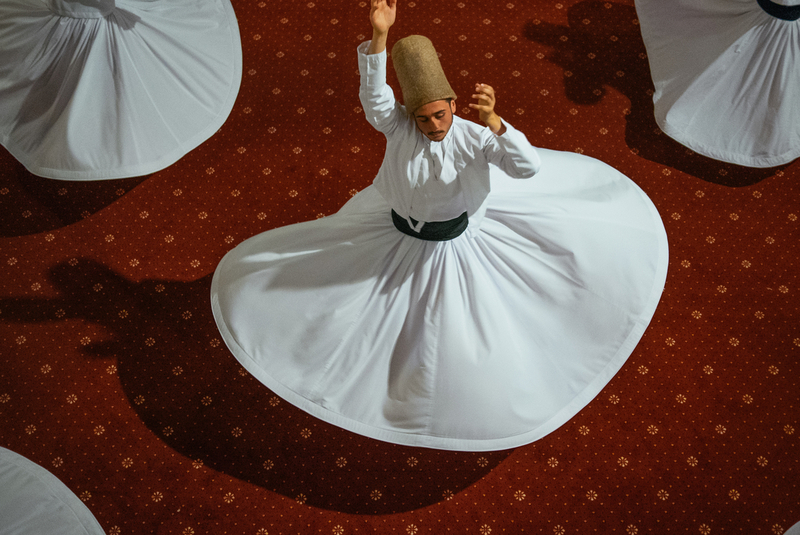 Try delicious Turkish snacks, be mesmerised by the Whirling Dervishes and discover the underwater treasures of the Mediterranean on a relaxing boat cruise. From the laneways of ancient Ephesus to the bizarre landscapes of Cappadocia – take the plunge and discover a unique travel adventure waiting for you in Turkey. Welcome to Turkey. 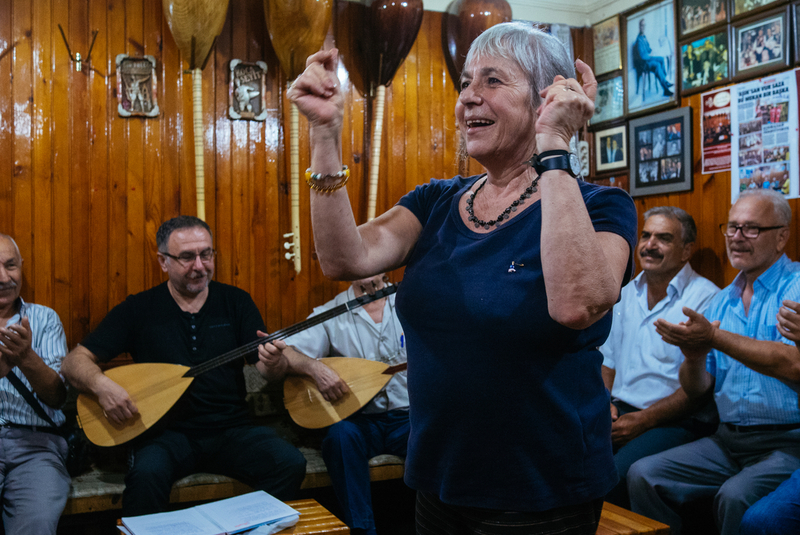 This adventures kicks off in Istanbul, the continent-straddling metropolis that the Greeks, Romans, Byzantines, and Ottomans have called home. You welcome meeting commences at 1pm – make sure you have all your important documents and details for your leader. Double check with the hotel reception or the noticeboard for meeting confirmations. 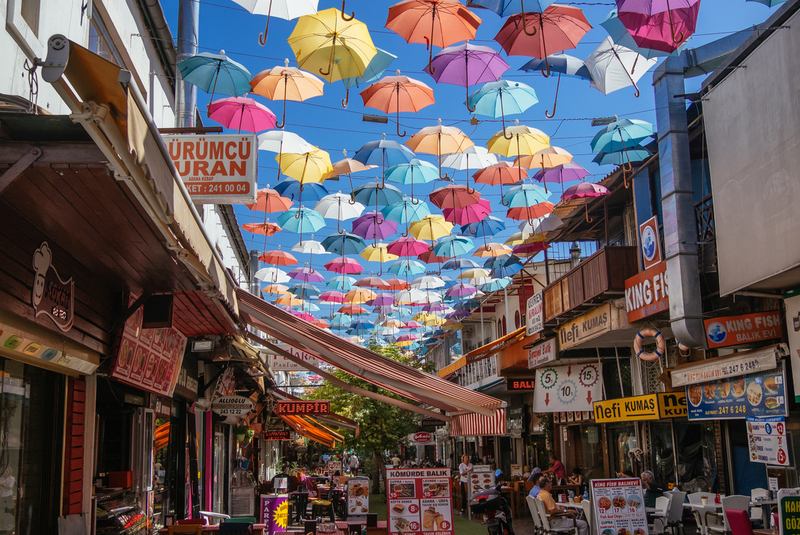 Until then, maybe get out and explore the frenetic streets of Turkey's crown-jewel metropolis. After the meeting, maybe gather together your new friends and seek out some Turkish cuisine in a street-side cafe. Notes: If you can't arrange a flight that will have you arrive at the hotel by early evening, you may wish to arrive a day early, so you're able to attend. We'll be happy to book additional accommodation for you (subject to availability). If you're going to be late, please contact the hotel reception. For Monday departures we recommend you visit the magnificent opulence of Topkapi Palace on Day 1 as it is closed on Tuesday. Today, set out on a half-day trek along a section of rugged coastline, following part of the ancient walking trail of the Lycian Way to nearby Oludeniz (approximately 6 kilometres), where you can swim in the famous Blue Lagoon. You’ll walk up a steep rocky path up the hillside, make your way through some forest, and then top a hill with fantastic views out across the Mediterranean. At the final descent into Oludeniz, you’ll be greeted with a breath-taking view of an arching peninsula of white sand beach cutting through crystal waters and verdant vegetation, the town’s trademark panorama. The colours of the incredibly picturesque Blue Lagoon, with perfectly still waters and a scenic backdrop of pine-forested hills, are amazing, and you’ll soon realise why this is one of the most photographed beaches in Turkey. Notes: The trek to Oludeniz is rated ‘moderate to difficult’, and a good level of fitness is required. The terrain under foot is sometimes slippery and uneven and there are periods of ascent and descent. Good walking shoes are certainly required. If you do have a good level of fitness, this will be an extremely enjoyable and rewarding walk. If you are unsure as to your capability to complete this walk, please discuss with your group leader before undertaking, so that other arrangements can be made for this day. Make your way the short distance from Kayakoy to Fethiye by dolmus (a Turkish shared taxi). From there, take a public bus to Kas (approximately 2.5 hours), with some spectacular coastal scenery greeting you on the drive. The picturesque village of Kas – whitewashed buildings covered in bougainvillea and cobbled streets – is the southernmost of all the Turkish resorts, and the starting point for your fantastic boat trip. The best places in town to swim are from the waterfront restaurants that have their own private water access. For the price of an occasional drink, you get your own deck chair, umbrella and unbeatable views. When the sun goes down there is the chance to explore the handicraft markets, where you can find beautiful handmade wares with a distinctly Turkish flavour. Once you have checked in, take a leader-led walking tour of the town. Notes: Due to varying weather conditions over the season we have a varying itinerary as follows: During the cooler months of March, April, October and November we don't spend a night on the boat and instead stay in a local guest house for two nights in Kas. During the months of May and September our normal itinerary will run with one night on the boat and one night in a local guesthouse in Kas. During the months of June July and August we spend two nights on the boat, and don't spend a night in the guest house. Leave Konya this morning by bus (approximately 4 hours) and head to the heart of Cappadocia. The town of Goreme lies in a fantastic region of cones, needles and columns, fashioned by nature from the soft volcanic tuff rock. It's honeycombed with caves scooped out to make churches and dwellings that are known as fairy chimneys and castles. In times of peace, the people in this region lived on the land, but in times of war or persecution they took to living underground. When you arrive in Goreme, you can stretch your legs and take an orientation walk with your trip leader this evening. 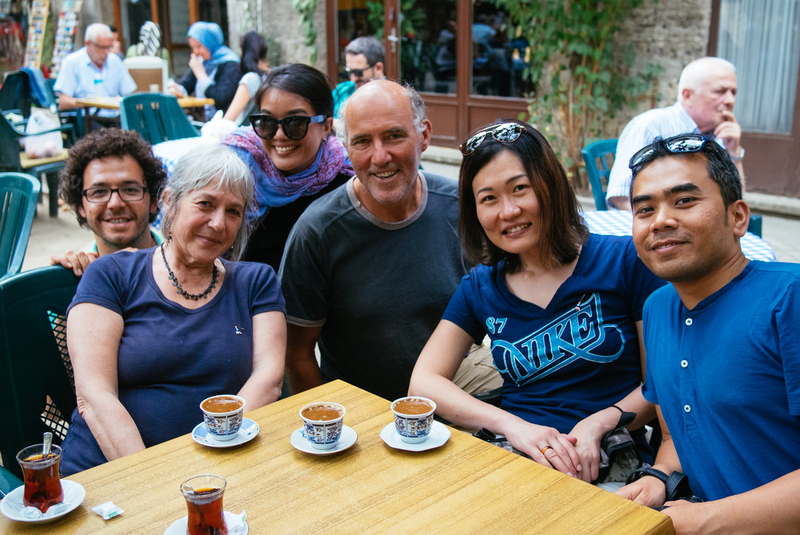 Then grab a beer, a tea, or perhaps a strong Turkish coffee if you need a pick-me-up (Turkey is the land of beverages, especially the hot variety). Don't forget to pack sturdy, well worn-in walking shoes or boots and a comfortable daypack for exploring the valleys of Cappadocia. Notes: Without a doubt, one of the most amazing memories of this journey is a hot air balloon ride over the majestic landscape to see this otherworldly scene at sunrise. Those who are interested in this optional extra will have a truly awe-inspiring experience. The cost of this activity varies depending on what type of flight you choose. This activity can only be booked locally. Please speak to your trip leader on Day 1 to organise this.